People have been striving for a common language since construction was halted on the Tower of Babel. In the modern world, that desire has been extended to people’s machines. Computers talk to other computers that talk to smartphones relayed via satellites in an ever-expanding chain. For radiologists, better communication between machines translates to better workflow and, presumably, better patient care. In an effort to improve machine-to-machine communication among radiology departments, a Society for Imaging Informatics in Medicine (SIIM) workgroup has undertaken the task of developing a workflow lexicon for radiology. Because vendors define workflow terms differently, there is no reliable way to compare these terms and, hence, the systems. The workgroup’s goal is to create a description language to standardize workflow definitions. Meeting in October and again at RSNA 2010, the workgroup developed a comprehensive list of roughly 100 terms that describe workflow steps in a radiology department. The hope is that standard definitions will allow system-to-system communication across disparate technology platforms regardless of vendor. Erickson believes this initiative could lead to the development of best practices for radiology workflow because it would facilitate comparisons among radiology departments and help clinicians determine which processes are most efficient. In the long term, widespread agreement on terms could allow systems to reliably sequence certain events, which would pave the way for automating some workflow steps. Automation offers significantly more consistency, which can promote higher levels of efficiency and quality. To make that happen, the dashboard software will need access to time-stamped data for important events, which requires a reliable method for gathering data from systems. Getting that information will require vendor cooperation. Several vendors, including GE, Philips, and Siemens, attended the workgroup meeting at RSNA 2010 and planned for a pilot demonstration at this year’s SIIM meeting, which runs from June 2 to June 5 in Washington, D.C. The test will measure whether designated workflow terms can be captured from different vendors’ products and aggregated at a single workstation using dashboard software. Erickson says the demonstration, which will be completed in a couple hours, will only test a few definitions, such as waiting time and turnaround time, but it should be a good indicator of what steps need to be taken next. Since the Health Level Seven International interfaces and DICOM profiles don’t exist, the information will be exchanged via Web services. While the project is still in a very early stage, Erickson sees the increasing likelihood of pay-for-performance initiatives as a good reason to push forward. Although pay-for-performance is narrowly defined as it relates to radiology, continuing improvements in technology for demonstrating performance mean it will probably become a bigger part of the reimbursement cycle in the future. 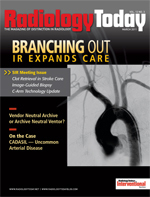 Being ahead of that curve can only benefit radiology departments. If the project progresses, RSNA’s RadLex Committee has expressed interest in incorporating SIIM’s workflow definitions into its standard, which doesn’t currently deal with workflow steps. Working alongside RadLex should add some momentum to the SIIM effort. Rather than wholesale adoption, Erickson believes departments will likely take a piecemeal approach, capturing a few workflow steps at a time to meet specific, well-defined goals and working through the list as their needs dictate. It may take some time for the project to gain traction, but he thinks that steady progress can be made.